Lilian Shang has been haunted by her father for many years. 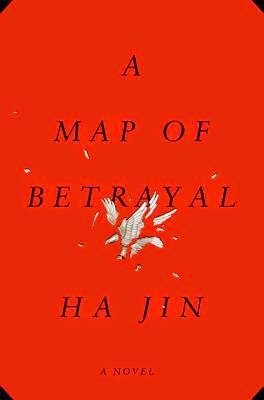 A Map of Betrayal is both of their stories, and in typical style for Ha Jin, it’s an elegant, restrained exploration of family, loyalty, and patriotism. Lilian’s father Gary immigrated to the US as a translator with the CIA, where he earned a stellar reputation for his superlative work and dedication to his team. Until it was revealed that he was receiving the exact same commendations from the Chinese government for his work as a spy. The double life was even more pervasive than just a career, though–Gary even had a secret family back in his homeland. A wife and two children who were kept hidden away from him in order to keep him focused. A temporary teaching post in China gives Lilian the chance to track down her father’s elusive past in an attempt to understand him. To reconnect with the family and the parts of her own self that have been kept from her for so long. Ha Jin’s elegiac novel is haunting and spare–specialties of his. The emotional restraint is at times infuriating, but the payoff is sound in this case. If the subplot involving Lilian’s nephew is a touch too spot-on, well, the central storylines make up the difference. And if the first hundred pages are a bit slow, the last half of the book makes up for it for the most part. It could be said that you never really get to the meat of this story, and that would be fair. Ha Jin has a way of getting in his own way by making his characters a touch too emotionally restrained. What I’m saying, I suppose, is that while A Map of Betrayal is a flawed book, it is still a good book and well worth the effort.